Study the production and use of gases by plants and animals. Measure the oxygen and carbon dioxide levels in a test tube containing snails and elodea (a type of plant) in both light and dark conditions. Learn about the interdependence of plants and animals. Use an indicator (brom thymol blue) to measure concentrations of oxygen and carbon dioxide. Design controlled experiments to test hypotheses. Discover what gases are used and produced by animals. Discover what gases are used and produced by plants (in light and dark). Explain how animals and plants help each other survive. Revised student explorer worksheet. This simplified worksheet may work well with ESL students like I teac... (more)h as well as struggling students. I found that preceding this lesson with a lesson on the function of indicators worked wonders for their understanding. Also attached REGENTS questions for HW. Modified exploration guide shows dependance of plants and animals on eachother as well as an energy sourc... (more)e.
I suggest that you precede this lesson with with a lesson on the role of indicators. May also use the ph analysis Gizmo to teach indicators. I liked seeing how the snails depend on the plants for their oxygen. 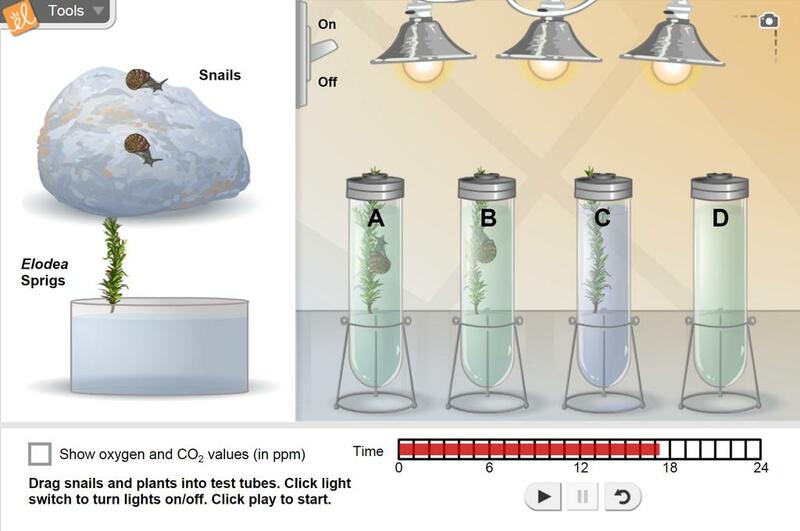 Excellent simulation that not only allows students to collect data regarding Photosynthesis, but it also allows them to design experiments.